Best Choice for Music Festivals Rave Carnival Halloween! The face jewels are prepared in 6 individual sheet,Self-adhesive application is easy to use but immediately make you glamorous. Just become the focus of party ! 1. 100% Non-toxic and Resuable. 3. Easy to apply, transfer and remove without any glue. PERFECT FOR PARTY TIME OR DAILY DRESS LOOK! 1.The face jewels are Self-adhesive,peeling off from the backing clear paper and stick on clean skin according to the designs. 2.The face jewels can be resuable.Clean them after your first time use,the adhesive glue has ran out, need to use eyelash glue or body glue to be adhesive again. 2. Discontinue use if irritation occurs. 3. Do not apply to sensitive skin, near eyes, of if allergic to adhesive. 4. Due to the difference between different monitors, the picture may not reflect the actual color of the item. Thank you! PERFECT for Music Festivals or for party favors ,also for pictures! Safe and fun for all ages, including kids & adults, and can be worn anywhere on your face or body. This series designs will make you look different,attractive,cool and elegant,become the focus of party ! EASY TO APPLY & REMOVE: 6 sheets face jewels are prepared in individual sheet.They are Self-adhesive,so application is easy,just peel off from the backing paper and stick according to the designs.No more need to use extra glue, so easy to use but immediately make you glamorous. REUSABLE AND SAFE:100%Safe and healthy material to use.Made of Rhinestone and Acrylic Diamond.The face jewels are resuable,clean them after your first time use,reuse with extra eyelash glue or body glue to make it adhesive to use again. 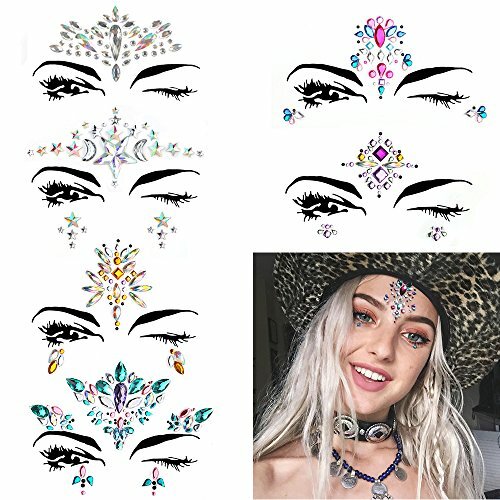 GOOD LOOKING FOR PARTING: This Face Jewels series will make you look gorgeous,just place your gems on your face and body, it will let you become the focus of party ! If you have any questions about this product by Diva Woo, contact us by completing and submitting the form below. If you are looking for a specif part number, please include it with your message.